This birth registry is open to ALL birth family members, 18 and over, seeking birth children or grandchildren, birth parents or grandparents, birth nieces or nephews, and birth siblings that are also over 18 years old. Research Etc. performs adoption searches nationwide. We are experienced in locating and arranging reunions between adult adoptees, birth parents, and adoptive families. As each case is inherently different, our licensed searchers strive to maintain strict confidentiality and sensitivity toward all parties involved. Contact us for more information on Adoption Searches. From the Case Files of Research Etc. 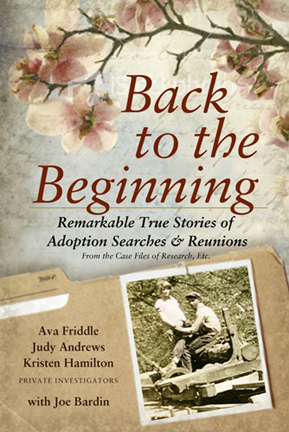 Back to the Beginning provides an insightful and often dramatic perspective on adoption searches and reunions. From a daughter seeking to understand the trauma her birthmother went through in relinquishing her; a son wanting to set the record straight on his own family history; to a birthfather who never even saw his daughter when she was born, but never forgot her - each story is personal and thought provoking. 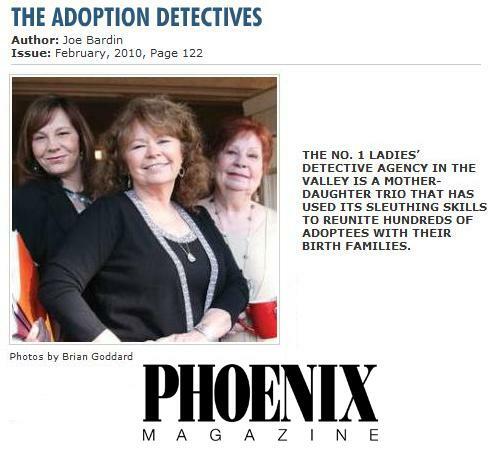 Research Etc., Inc. has been very successful in reuniting birth families in Arizona and all over the United States. Whether you have scads of information or virtually no information surrounding the adoption, we can help. Because our firm specializes in adoption search work, we are very sensitive to the emotional issues surrounding triad members (adoptees, birth family, and adoptive family.) Our goal is to uphold the highest moral standards by considering the wishes of all involved. Because each adoption search is unique in all aspects, we strive to tailor our search to your special circumstances by allowing you to play an active roleirst contact. By having an intermediary act on your behalf, it gives everyone a chance to voice their wishes and/or prepare for contact. You can only imagine what it would be like to be in the middle of a dinner party with 10 people and the phone rings. Naturally you answer it and hear, "Hi! Remember me? I am the daughter you relinquished 30 years ago." or "Hi! I am your birth father!" and maybe you didn't know you were even adopted. These scenarios create a devastating situation for everyone involved as the person on the receiving end has nowhere to run and no time to prepare and the caller may feel instant rejection by the answerer's response. As experienced adoption searchers and intermediaries, we know how to handle these situations delicately and give the search subject a chance to digest the phone call and think about what they want to do. In a nutshell, having an intermediary makes the transition much smoother and easier for all involved. Because each adoption search is unique in all aspects, we strive to tailor our search to your special circumstances by allowing you to play an active role in the search. We provide you with updates and allow you to be as much or as little involved as you wish. We are aware that money doesn't grow on trees for most people and that's why we help you to keep your costs at a minimum. We can perform your entire search from beginning to end, we can pick up where you've left off, or we can do only a select portion of your search for you. 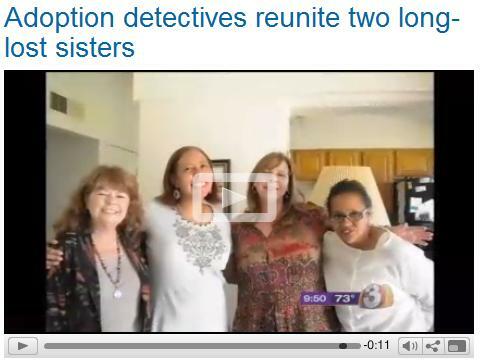 We reunite adoptees with birth parents and other family members such as siblings, aunts and uncles. Please check our listings on All States' Programs & Reunion Registries to see if your state has a Confidential Intermediary Program. What information do you need to in order to begin a search? Oftentimes, our clients come to us with little or no information. If that is the case, we are able to direct you on how to get more information. So, basically, if you know your adopted name, place of birth and your birth date, that's enough information for us to get started! Do the private investigators stay within the law while researching my birth parents identities? Wealways stay within the laws on any type of case we work on - whether it is an adoption search or otherwise. Because of my personal background of being a Paralegal, we are all particularly aware of making sure that any kind of work we do is within the boundaries of the law, and if ever need be, our investigators and their work could stand up in a court of law. You have probably heard of PI's who claim that they have gotten information, illegally, "through contacts." We simply do not work that way! How long does the average search take? The average search can take from ten minutes to a couple of years. It really depends on how much information we have to work with and how much more we are able to get. If we are working with a particularly common name and an "age range," the search will likely take much longer than when we have an unusual name and a date of birth for our search subject. Sometimes we have been given inaccurate information from the start, which can also delay a search. I wish I could give you a better idea, but each case is inherently different and the time frame is reliant upon a myriad of factors. Is there a risk that no information will ever be revealed? If so, what are the statistics on that from your company? For example, your percentage rate for actually finding birth parents? We have reunited well over a thousand people in our 21 years of being in business. I would say that there have been about 10 people that we were simply unable to locate. Of course, that is just an approximation, but in the instances where we were unable to locate someone, it has always been because we have been given inaccurate information. For instance, if a birth mother has outright lied about her name, age, etc., there is usually no way we can locate that person. There have been instances where we have even located people who have tried to conceal their identities, but that is rare. Also, if we locate a birthmother who is unwilling or unable to reveal the identity of a birthfather, (and has not provided information about him), chances are slim to none that we could find him. Some birthmothers have taken their secret to their graves. Again, it's just dependent on how many pieces of the puzzle we have (and can get) to complete a search. Do you offer me a chance to talk to any past customers with respect to their searches and gain feedback on your services? Certainly! Although we are strictly confidential about our clientele, we do have past clients who have offered to speak with any potential clients who have questions about our work, our company and our investigators. If you'd like to speak with someone, let me know - it may take up to a couple of days to arrange that. Depending on your wishes, it can go a couple of ways: There are those who want to make the first contact themselves. In that case, we give them advice and the phone number to call. We always preface each phone call with the advice that it may not be the birthparent - usually, we cannot have 100% "proof" that the person we are calling is our search subject without confirmation from that person. Sometimes we "know" it is, but we always need actual confirmation in order to positively confirm anything. If you choose to use our intermediary services (highly recommended! ), we let you know that we have located the person we believe to be your birthparent prior to any phone calls to them. We ask what you'd like to convey, give some advice and talk about possible outcomes prior to the call. Once we make the call, it is handled with absolute sensitivity and confidentiality - we will only release as much information to the other party as you are comfortable with. What percentage of your searches go beyond the initial retainer fee? We try to keep every search within the initial retainer costs, and we don’t go over the initial amount without permission from you. About 25 percent will go over, usually only for a few hundred dollars, and the most likely reason is because there is extra research to identify and locate the birthparent currently. When can I call to discuss my case? As a provider of such services, you may not always have successful outcomes, whether you are unable to locate someone, the person doesn’t want to be located, or there is a reunion, however, it doesn’t pan out. I really want to share our story with you, as it is very exciting and it has made me very happy. It has been a year ago today that I called you to let you know that I wanted you to pursue the search for my birth mother, Karen. I had every intention of letting you know that Karen had reached out to me, I just didn’t get around to it and time flew by. Since I recognized that it was a year ago, I felt it appropriate to email you this today. Karen first emailed me directly on June 11, after her apparent hesitation that she had conveyed in her initial responses to you. I sit here and am still amazed at what has transpired in this first year, after going through the search process for six plus years before contacting Research Etc. I really want to thank you as this has developed into an amazing relationship. I couldn’t have asked for or expected a better outcome. After Karen’s initial email to me, she and I emailed regularly, and that really is an understatement as far as the frequency is concerned. We shared so much about ourselves, our loved ones, and our feelings. As you and I had spoken about, I never had felt any kind of resentment, nor did I ever question Karen’s choice on adoption. I think knowing and feeling that, really helped make our relationship develop naturally. Karen and I do have similar traits which also helped in the relationship; mostly our openness and honesty. It was July 12th-14th, that the prospect of actually meeting in person surfaced. Karen was scheduled to visit China and so we discussed a possible meeting last fall. From July up until we met on October 13th in San Francisco, we still were corresponding via email regularly. I was nervous about the meeting and wasn’t sure if it would work out or not. After we spent that first day together, it was apparent to me that I would not only enjoy communicating with Karen via email but truly enjoy visiting with her as well. We visited the maternity home, the hospital of my delivery, toured around SF and she took me to tour the area in which she grew up and went to school. We arranged to spend the following day together. We spent the day together and then her husband Terry came into the city that evening to meet us for dinner. We agreed to again get together the third day, in which she took me to her home and I met my half sister Kayla over lunch. The only thing I regret from this trip was not having more time to spend with her. Unbeknownst to me, at the time, that wouldn’t be a problem. We discussed a potential second visit and that was to have Karen come to Seattle to see my home, meet my husband and meet her grandchildren. Excitingly enough she was able to bring her husband, my half-brother Jerry, and Kayla. They came in early January and we had a very enjoyable time. Again, to my surprise, Karen had booked a flight to visit me for my birthday in February. She and Terry came out on a road trip in March, in which I was able to travel with them to Phoenix, so that she could see where I grew up and she was able to meet my dad, step dad, oldest brother and other extended family. Karen will be out to Seattle again in June, another visit I am looking forward to. So, as you can see this has certainly evolved into a loving relationship and she has become part of my life and my family and vice versa. We continue to communicate regularly, now even comfortable enough with phone calls and text. I again want thank you for your efforts in this search, I truly can’t express enough what it has meant. The year has been wonderful and I am looking forward to many more years that I can spend with my mother in my life. There are emotional issues surrounding the adoption triad (adoptees, birth family, and adoptive family) members. These books can help understand the nature of adoption and the relationships among the adoption triad. Back to the Beginning by Research Etc. If you’ve read a great book not listed here, we’d love to recommend it to our triad readers. Please send the title of the book and author to us at RSearchEtc@aol.com and we will add it to our list! Please call us at 800-992-3571 or email RSearchEtc@aol.com if you would like to discuss having Research Etc., Inc. perform your adoption search. There is no charge to discuss your search options with us and never an obligation.